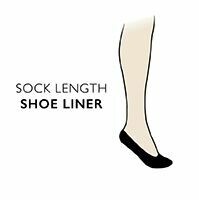 Put a bit of sophistication between your feet and the world when wearing summer shoes with Pringle Melissa Laser Cut Shoe Liners, fine woven opaque socklets in a twin pack of contrasting shades, lace-fronted for a pretty toe look in open shoes. These low and laser cut liners will remain your secret weapon for comfort, made in a cotton rich weave, with added Lycra for better fit and shape retention. The shoe liners are edged with anti slip silicone grips at the inner heels and across the foot, just before your toes, to keep them comfortably in place.